Before you get started in beekeeping, there are many decisions you have to make. Here are a few items to consider before getting started. 1. Configuration. You have the option to run all deeps or all mediums, or a combination of the two. Going with just deeps or mediums gives you advantage of using the same equipment on all your hives. When filled with bees, honey and pollen, boxes can get quite heavy. This is why some beekeepers run all mediums to help with the weight factor. A combination of deeps and mediums gives you more flexibility throughout the season, but you may not have a medium or deep when you need it. Plus you'll need different sized frames to contend with throughout the season. 2. Type of wood. The type of lumber you use can have an effect of how long your hives last, how well they insulate your bees, and how they hold up to the weather and the clumsy beekeeper. The main species of wood used on hives are pine (the cheapest), western red cedar and spruce. Pine is by far cheaper, but it doesn't hold up well to the elements; that's why they're often painted. Spruce is more affordable and rot resistant, but it's hard to locate in the midwest. Western Red Cedar, though pricey, will hold up almost indefinitely without paint or sealer. It's the best way to go if you don't want to wait for the hives to "cure" after painting or sealing. What's also great about cedar is that they come in rough cut, which encourages the bees to line the interior of the hive with propolis; this is a good thing. Propolis acts as an extension of the bees immune system. You may also want to opt for 2" thick (actual 1.75") in lieu of the more common, 1" thick (actual .75"). This will aid in better insulation throughout the year, but it will add a bit more weight and you will most likely have to custom cut it yourself. 3. Hive Protection. As mentioned above, it may be necessary to protect your hives from the elements, especially if you opt for pine. If you paint, make sure you get NO VOC paint. If going with a natural look, opt for raw linseed oil or raw teak oil. The less volatile organic compounds the bees are inhaling, the better. You can get "oops" paint at the local hardware store, and if it's light enough, they'll even tint it for you further. Some people like to paint their boxes different colors or with certain designs. This is actually helpful to the individual colonies so they can easy identify their home. The longer the paint or sealer can cure, the better. If you have to wear rubber gloves and respirator, is this something you want to have inside the hive? Remember that wax and honey is permeable so these chemicals can leach into things that you, and others, eventually consume. Bee Found does not use any treatments or medications on any of our hives. And we do not teach these methods. We believe that principals should be take the spotlight over methods. And our principals is that we are trying to create stronger, healthier bees. Any chemical that is used on a colony will weaken them, weather directly, or indirectly by breeding stronger mites and pests. We want clean honey, wax and bees for our clients and customers. Having said that, it is ultimately your decision if you want to treat your hives. We just ask that you be up front and honest with your customers when selling your products. Most consumers who buy honey have no idea that beekeepers use medications and no one wants more chemicals in their food. Treatment free is not management free. You still have to make sure your bees are healthy and are building up as they should be. 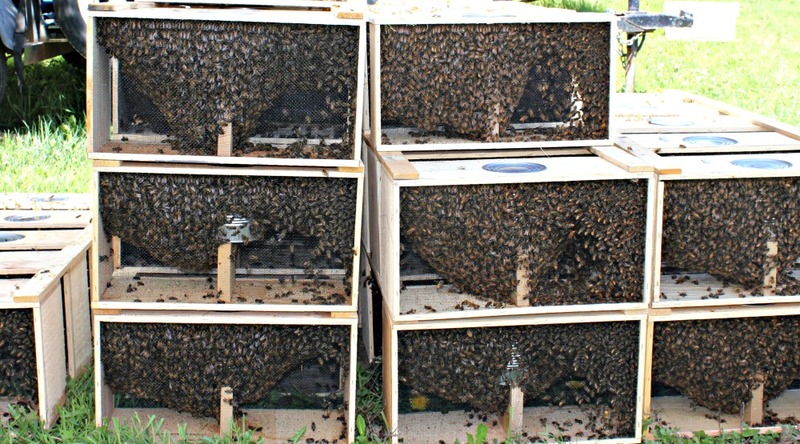 One of the most common questions we get is, "Where do I put my hive?". Generally, you want them as far away as people as possible. If you're a hobby beekeeper with a small yard, put them in the back corner of the property, preferably next to a 6' tall privacy fence. This forces the bees to fly up and over the heads of pedestrians. Another option is flat roofs. If you have easy access to the roof, this makes for a great place to keep hives. They stay away from people and they enjoy being up high. Just make sure there’s easy access. DO NOT BUY BEES THAT ARE NOT LOCAL! One of the main problems new beekeepers have, is their new bees. Bee organizations and clubs sell packages and nucs of bees to new and existing beekeepers, without telling them the potential downsides. Such as, anywhere from 40-80% of packages die within the first year. Also, most of the bees have been pre-treated for varroa before shipment. What kind of medications were used? When were they applied? What we don't want is to have these larger organizations shipping in bees from non-local areas. These bees are not acclimated to our area, they've been shipped long distances which adds stress to the bees, and the bees are usually a mix of different colonies, including the queen, which makes them not as loyal to the queen as they should be. These shipped bees can also bring in foreign diseases and pests (mites) from other areas. This can quickly spread to your other colonies, and introduce other genetics of mites to the mites you already have. The best way to get bees, is to get free, local bees. You can do this by catching swarms and by setting bait hives to catch feral swarms, or by finding a truely local supplier. Spring is the best time for swarm catching, but bees will swarm throughout the summer season too. The second best option is to buy bees from local beekeepers through splits or full, established hives. The second option is much more expensive than free bees, but it's still a good option if you want to build up before winter.